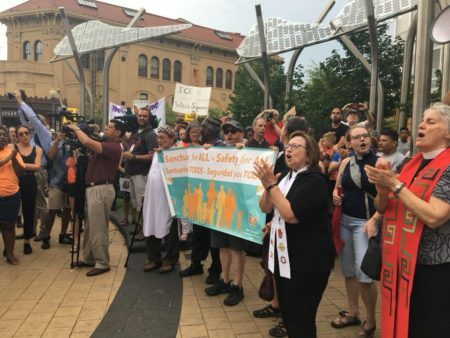 Created in 2017, DMV Sanctuary Congregation Network is an organizing network of congregations in the DC/MD/VA region that provide support and solidarity to neighbors, friends, and family who fear being detained, deported or profiled. In the face of hate and discrimination, the Network is committed to showing love, compassion and hospitality. A primary focus for the Network is Deportation Defense: pulling out all the stops to keep a neighbor facing deportation from being deported. This includes advocacy, community organizing, fundraising, family support, media outreach and communications. 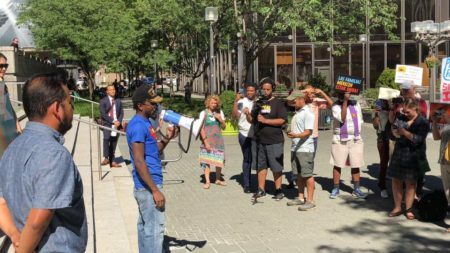 Some congregations are also accompanying people to ICE check-ins and legal hearings; holding Defend Your Rights trainings; hosting people who are at risk of deportation; supporting congregations that are hosting; and pressing their cities and states to get ICE out of schools, jails and courts and to end all policies that racially profile and over-incarcerate people of color. Omar Angel Perez is the lead organizer for the DMV Sanctuary Congregation Network. The Network operates under Faith in Action’s LA RED campaign.